I used Staking Hearts Honey Cuts ( dies) and Love You honey cut steel dies for today and I added colours using Ciao Copic Markers. The truth is that I was going to create a heart shaped window on the front panel of this card and I was going to stamp a love - Christmas scene inside using one of my fav stamp sets ever by Honey Bee called Let it Snow . 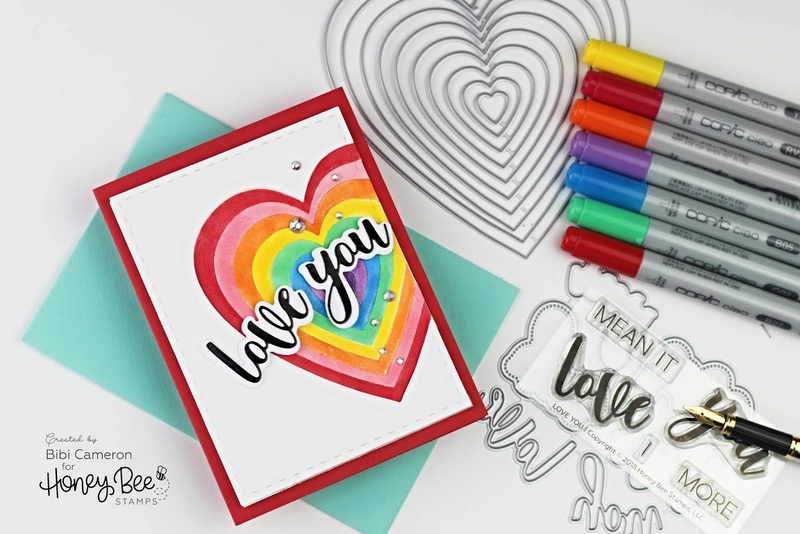 I planned using Staking Hearts Honey Cuts ( 10 pieces die set) . These dies come all attached by a wire and using players I removed the 2 largest dies in the set. I left the other 8 dies together and I die cut the window in the front of a panel I previously die cut using A2 double stitched frame dies ... and WOW !!!! 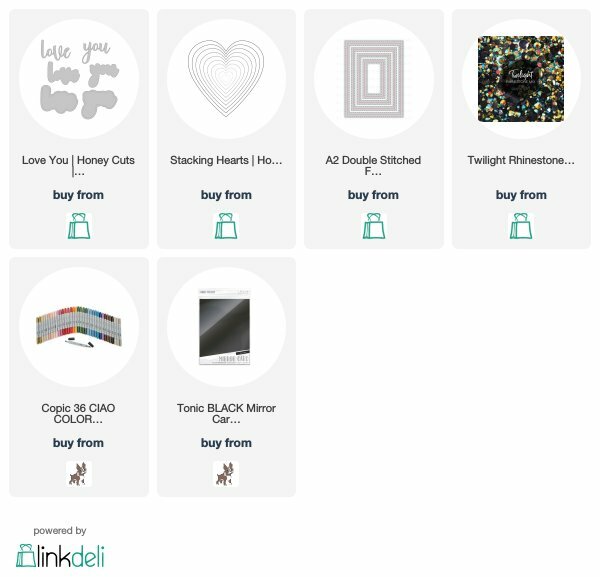 I loved the way the heart die cuts looked!! they were perfectly symmetric heart-shaped rings, I could easily layer them together to create a fun and easy element for a card. I could layer them in many different ways as well but I also wanted to add dimension to this card so using double-sided foam I adhered the panel with the window on an identical piece of paper. I added colour to the die cuts using copics and I glued them in the centre of the window. 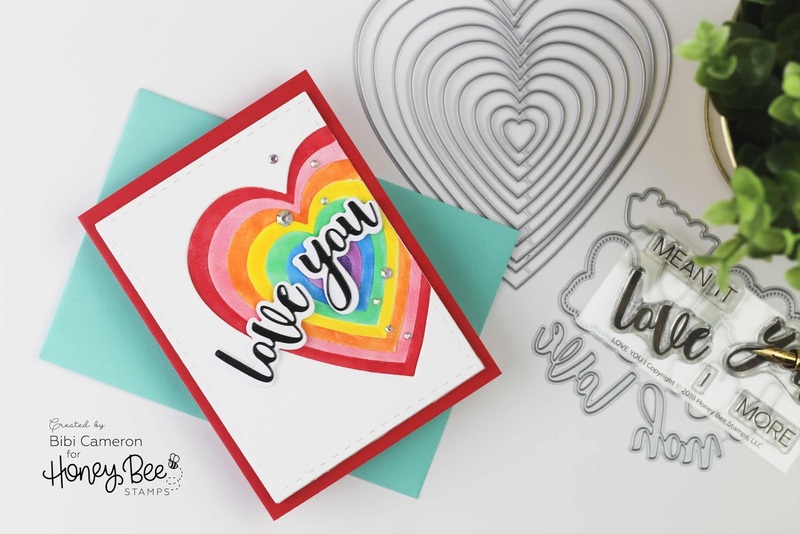 You actually can cut paper in different colours and you can make up to 8 cards with all the die cuts but I'm working night shift and I didn't have the privilege to try this. So at that stage, my original idea completely changed and I decided to create the card you see in the pictures. For the sentiment, I also Love You honey cut steel dies to create the sentiment and although it is hard to see in the pictures I used Craft Perfect Black High Gloss Mirror Cardstock for the sentiment. I embellished with Twilight Rhinestone Mix and applied shimmer using a Nuvo Shimmer Pen over the hearts. 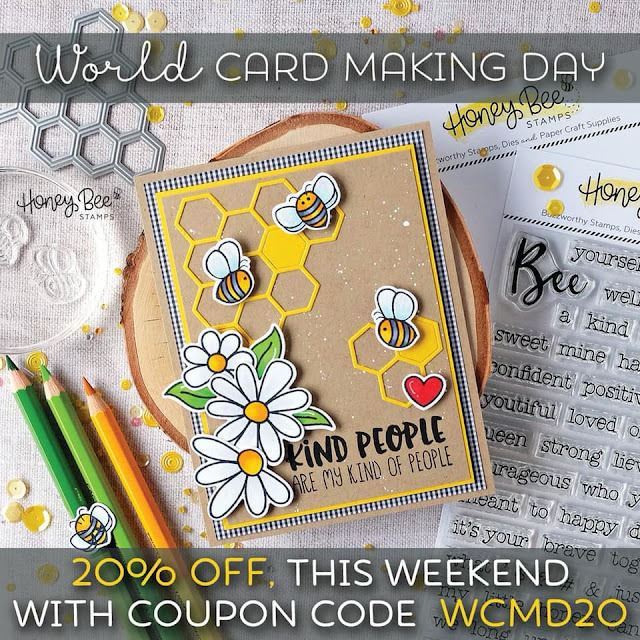 Celebrate World Card Making Day with 20% off your Honey Bee Stamps order! The promo is today and tomorrow till midnight. coupon code: WCMD20 at checkout to qualify. 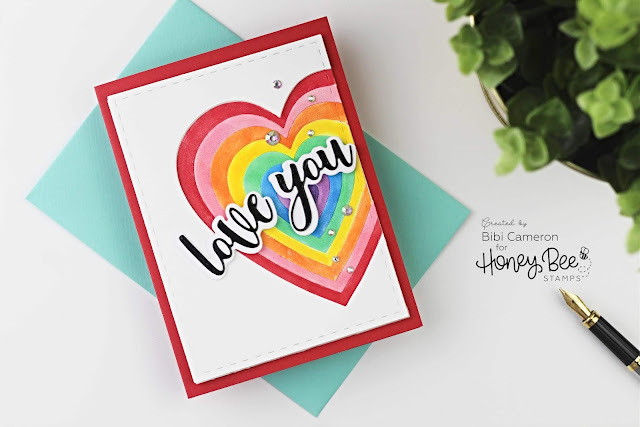 Fabulous card, loving the cheerful colours you have used, you will have to do idea 1 another time but I am glad you went with idea 2 today. I am just getting into Honey Bees their ideas are wicked.